The Globe recently reported on how the best workplaces are allowing parents to bring their newborn babies to work, claiming the policy as the latest craze in attracting employees. It’s a start. But if top employers want to attract the best possible workforce, it’s not going to be just by appealing to new parents — of children, anyway. 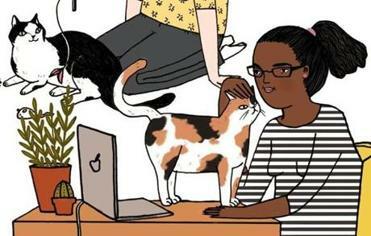 Employers should focus instead on the owners of furry, four-legged friends. There are only 20 million babies in the United States, but there are 80 million dogs. Pardon the hyperbole, but I’ll just come out and say it: We may never be a world-class city until companies in Boston adopt more dog-friendly policies. Allowing people to bring their dogs to work makes a bold statement that we have the kind of environment that is fun, edgy, and — sure — a bit madcap. Beyond that, in this day of digital distance, companionship is an itch that all humans need to scratch. What brought me to this soap box was a chance visit to the Crate & Barrel store on Boylston Street in search of new throw pillows. I noticed a sales associate walking into the showroom with his spiffy, fox-like Finnish Spitz, clad in a smart plaid coat. The dog preened atop a mid-century leather sofa while his owner attended to customers. I seethed with jealousy. I may not own a dog today, but a future and better version of myself does. And when I have that dog, I’m going to want to bring it to work with me. Unfortunately, my present employer doesn’t allow it. Codgers. 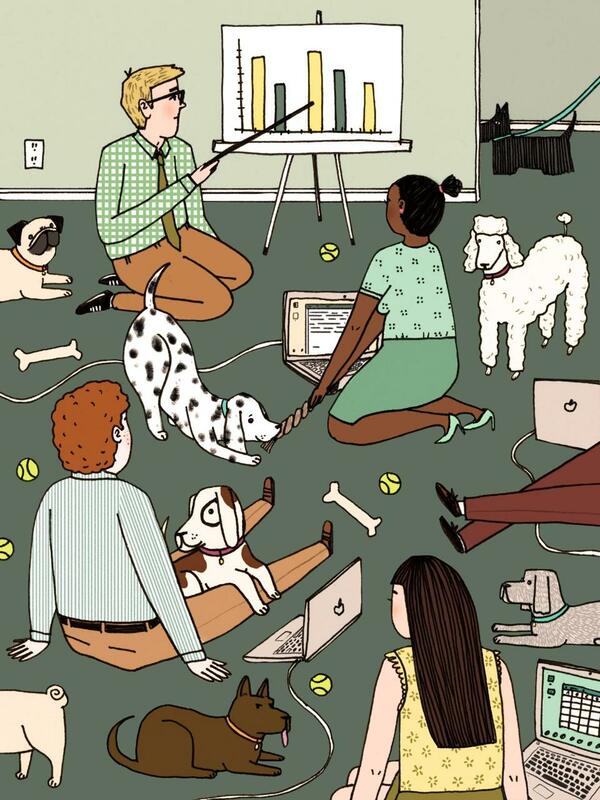 Thankfully, there are forward-thinking companies that regularly allow their employees to bring their dogs to work. One is located in a small downtown office building upstairs from a friend of mine. She was recently in a meeting in her conference room, when a lone terrier wandered in. “Whose dog is this?” she posted on her Facebook page. It was soon reunited with its owner. “Employees work longer hours because they don’t have to race home to walk and feed their dog,” she says. “Even people who don’t bring dogs to work are still psyched to be around other people’s dogs.” In her own 400-person office, where approximately 100 bring their dogs, visitors wouldn’t even know that dogs were there, as all were resting in their beds while their owners worked next to them, she says. What about allergic co-workers? Fearing says clean workstations and HVAC air filters solve most concerns. In fact, the practice is more healthy than not, with average employee stress levels plummeting in dog-friendly environments versus their non-dog counterparts, according to a recent study in the International Journal of Workplace Health Management. Even airports are now deploying therapy dogs to ease travelers’ anxiety and to lessen the stress of travel. I’m not sure where I’ll be working when I finally have a dog, or for that matter, a baby. But this much I know: One of them will be coming to work with me. Mike Ross is a former Boston city councilor and attorney. He writes regularly for the Globe. Follow him on Twitter @mikeforboston.